With increasingly official word from the White House yesterday that President Donald Trump does indeed intend to rescind the Deferred Action for Childhood Arrivals (DACA) program created by President Barack Obama to protect undocumented immigrants who came to the United States as children from deportation, Republicans can be divided into two camps: those who enthusiastically support this harsh crackdown on the least offending group of undocumented immigrants, and every Republican who has at any point been forced to acknowledge a humanitarian interest in protecting this population–which is most Republicans who run in politically competitive districts and states. Colorado has prominent Republicans in both of the aforementioned camps, from nationally infamous anti-immigrant firebrand Tom Tancredo to GOP politicians considered today to be key “moderates” on the issue like Rep. Mike Coffman. Coffman, as we noted last week when word initially broke of Trump’s intention to end the DACA program, is hopinh to use an uncommon legislative maneuver with hoped-for Democratic support to force a vote on legislation to temporarily continue most DACA protections. Mike Coffman’s public transformation from the Republican congressman who literally inherited Tancredo’s deep-red district into one of the GOP’s foremost alleged proponents of the rights of immigrants all goes back to the 2011 redistricting cycle, which redrew Colorado’s CD-6 into a diverse and competitive battleground district centered on the city of Aurora. 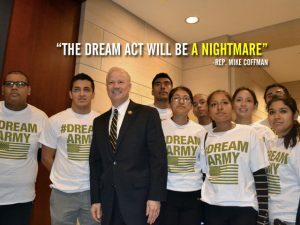 Prior to redistricting, Coffman did his level best to keep up Tancredo’s anti-immigrant rhetoric–declaring in 2010 that “the DREAM Act will be a nightmare for the American people.” Then, after nearly losing his seat in 2012 to an underfunded challenger, Coffman began a public about-face the following year that outraged suspicious Democratic opponents but slowly began to win over the media. In 2013, Coffman had the chance to take immigration off the table as a political issue, and participate a monumental bipartisan victory on immigration. We’re referring to the Border Security, Economic Opportunity, and Immigration Modernization Act of 2013, which passed the U.S. Senate with a huge 68-32 margin of victory–and then died with the Republican-controlled House refusing to move the bill forward. There are a host of reasons why the hard-won 2013 compromise from the U.S. Senate on immigration reform died as soon as it was sent to the House. One of the biggest, undeniably, was a perceived need to deny President Obama–who Coffman claimed in 2012 “is just not an American”–even the smallest of political victories. 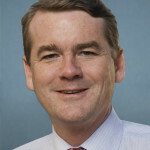 Sen. Michael Bennet of Colorado, one of the architects of the Senate bill, has called again this year for Congress to pass his bill; but the idea that today’s GOP-controlled Congress can pass anything even remotely close is wildly unrealistic. Coffman said immigrants in his district “should be concerned” about increased enforcement under the Trump administration. At the same time, Coffman defended the Trump administration’s actions. “[President Trump] is lighting a fire for Congress to act,” Coffman said. You know what, folks? We don’t even need to speculate about that at this point. If it happens, great–Coffman will have accomplished a tiny sliver of the reform needed, years after it could have happened. In the much more likely event that Congress accomplishes nothing once again, the only thing that will matter is this: Coffman is part of the Republican majority who either helped Trump or failed to stop him. Worse, Coffman had the chance to take this issue off the table years ago, and he refused. Either way, these are not the actions of “a hero.” This is a man dodging fate. So Mike Coffman is a hypocritical, sub-prime racist and part-time liar? Why does he beat every Democrat he sees in election after election? You've highlighted the former many times. You seem to have no clue about the latter. Coffman and Carroll spent equal amounts in the last election, – but he was more willing to lie and distort her record. He ran misleading ads about her, depicting her as a "tax and spend liberal" and a greedy personal injury lawyer. He also played on the old stereotypes about welfare recipients. I remember seeing a Coffman ad tying her to Somali Muslims in Aurora – but can't find it now. Coffman also put out misleading Spanish language ads touting himself as Pro-immigrant. Doubly ironic in view of his DACA stance. Coffman may have also gotten plenty of ad support from NRCC and other “issue” groups around his candidacy. Morgan Carroll focused on tying Coffman to Trump, and on his birther statements. I n the end, Coffman got his people to turn in more ballots. Where are all the Democratic Party Geniuses in CO? This is an epic issue for Coffman and one that Trump inflicted on him. Will be interesting to see how he responds. It will be interesting to see how his district responds because it will effect every immigrant family whether they are from Mexico or Syria. We now know when Trump asked minorities what they had to lose if they voted for him the answer is everything.